I've made Pad Thai several times before. It's one of my favorite take-out foods, and I like the homemade versions as well. This one - well, I'm not going to claim that it's authentic, but it *is* good. Really good. Using frozen wok vegetables obviously speed up the process - a lot. Feel free to use any noodles - I normally prefer rice sticks, but my husband much prefers egg noodles and he got his way this time. Add some chicken, shrimp or beef if you'd like! Start by cooking the noodles according to the package instructions - some need soaking in hot water, others might require boiling. Mix the sauce - just add all the ingredients in a bowl and stir together. Heat the oil in a large frying pan or wok, and fry the vegetables until crispy. Push them to one side and add the egg. 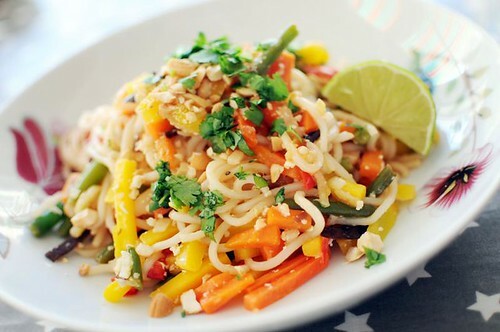 Stir-fry until set, then add the noodles and sauce. Stir well. Cook for a minute or two and serve - preferably with extra lime wedges, fresh coriander and chopped cashew nuts. Oh, I love pad thai. This recipe is getting bookmarked for sure! Thanks for sharing. If you don't mind can I ask you something? That is I got a loaf of frozen moose steak and grind moose from my husband's swedish friend. But I don't know how to cook it. So could you teach me how to cook?